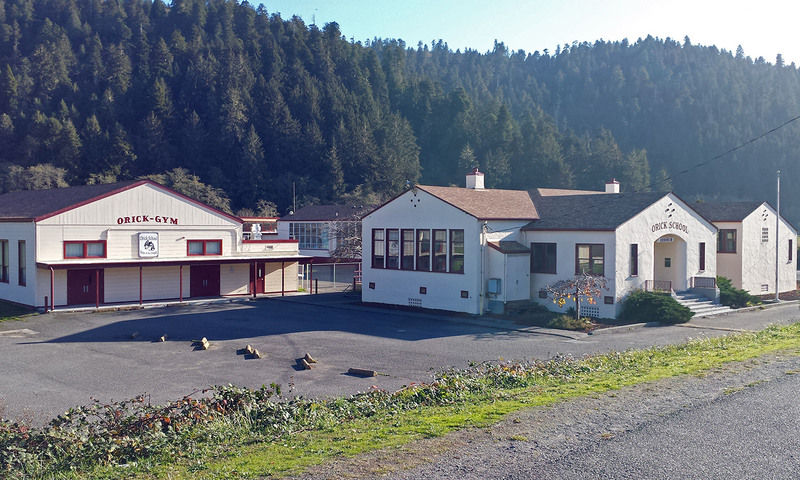 Orick Elementary School is a picturesque little school tucked away in Redwood Creek’s coastal valley at the southern gateway to Redwood National Park. At about 20 students, Orick School offers each child an individualized education. The teachers really care and have standards for every student. Even after working at Orick for 23 years, I’m constantly reminded of the area’s astonishing natural beauty. We often see Elk on the playground in the morning, eagles flying up Redwood Creek and sunsets over the Pacific that are postcard quality. In an effort to better utilize our natural surroundings, the teaching staff is coordinating with local partners to include a rich outdoor education curriculum. Some of our partners include Redwood River Trips, Redwood National Park and local ranches. Orick School is a progressive and vibrant place. In the summer of 2012 all of our classrooms were totally remodeled and they are beautiful. We offer students breakfast and a lunch cooked from scratch. New this year, Orick School will be leasing a room to the Redwood Parks Association. The District looks forward to this partnership for our students and community. Orick is one of the few places in Humboldt County where a modest two bedroom home is still affordable. Next time you are in Orick feel free to stop in and I’ll give you a tour of the school, who knows, maybe you’ll stay!